Recently, the New York Times started an investigation on the quality of tap water here in the United States with a series of articles. After receiving a Clean Water Filtration Unit from Cuisinart I became curious about the health and safety of our drinking water. Contaminants are dumped into our drinking water from a number of different sources each day. Coal burning power plants are cleaning their chimneys with scrubbers and water in attempt to trap pollutants before they are released into the air. Then they are left with waste water. The federal government does not have any regulations as to what they can do with this waste water so the power plants are dumping it into the lakes, rivers and streams. This water then leaks into the groundwater and gets into our drinking water. In Brown County, Wisconsin, run off from dairy farms is seeping into the groundwater and contaminating residents’ well water. The contaminants, including bacteria and E. coli are causing residents to have chronic diarrhea and ear infections. Farm runoff is not regulated by the government. On their website, EWG provides a tool that you can use to find out what chemicals and contaminants are in your drinking water. I was shocked when I found out what is in the water here in Sacramento. The water was tested from 1998-2003 and they found it contained 17 pollutants, including 3 unregulated contaminants. The total pollutants found were, Arsenic, Barium, Chromium, Nitrate, Sulfate, Chromium (hexavalent), Propachlor, Chloroform, Bromodichloromethane, Total trihalomethanes (TTHMs), Tetrachloroethylene, Radium-228, Tritium, Alpha particle activity, Strontium-90, and Gross beta particle activity (pCi/L). Exposure to these chemicals can cause serious health problems. Arsenic has been known to lead to cardiovascular problems, kidney failure, liver disease and skin irritations. Barium exposure can damage your reproductive system and your child‘s development. Exposure to Chromium may cause cancer, can lead to skin irritations, liver, kidney and reproductive damage. Using a water filtration unit can keep your family safe from these harmful contaminants. The Cuisinart Clean Water Counter top Filtration System is small, quiet and easy to use. It is convenient for home or office. All you do is pour your water through the top an it filters out all the chemicals. You can dispense hot, cold or room temperature water. And the water tastes clean and crisp. My family could tell the difference between the clean filtered water and our regular tap water right away. I’ve also found an improvement in the flavor of my coffee and tea after making it with the filtered water. 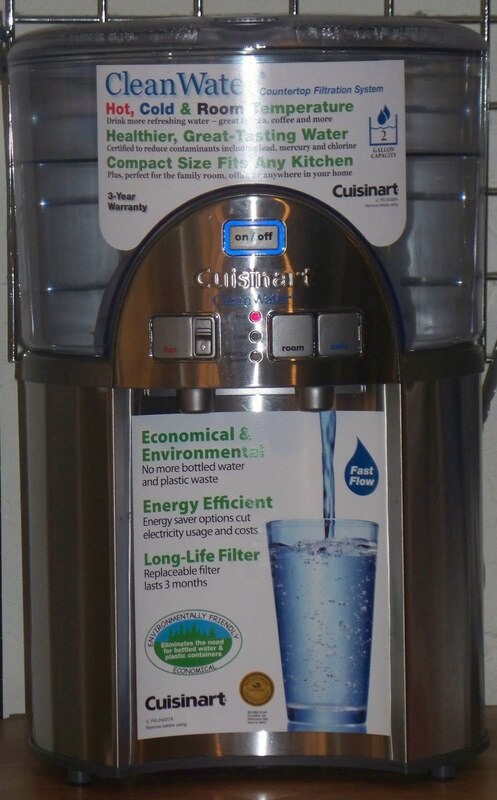 Now that I am using the Cuisinart Clean Water Filtration System my family is protected from harmful chemicals while enjoying more flavorful water. That is so scary!!! We drink filtered water and have one on our shower, but with all of the “stuff” in it who knows what is still getting through. Sometimes I do worry about that!!! I have filters at home. One outside and another by the kitchen sink. Double the filter. If we don't filter water now a days.. you will see all the rust in the water coming in :(. Hey Cascia. We finally received the bottle of Smelly Washer and my wife says she loves it. Thanks again. Regarding your post. I have been speaking about this for a long time including the opening chapter in my book Live Smart where I write extensively about the problems with the water supply today and it's implications on health. This also included information on water filtration. We use filters and exclusively take filtered water from home in stainless steel containers. I am glad that you did a post on it because you have such a large and growing readership that will help to increase awareness of these issues. Thanks again and nice job. You and your readers will enjoy my post on this topic from back in May. It is even more eye opening as to further disarray with the water supply and bottled water. What You Don't Know About Your Water Is Killing You? Oh yeah.. Imagining the kind of contaminants **shuddering** We do have a water filter for drinking water but not on the shower.. Guess should get one.. Thanks for highlighting this.. Thanks Cascia, we are actually in the process of getting our UV lake filter inspected, good to know about the cuisinart. Test your water at home with this easy kit. i like the idea of the filters. i am always cautious of tap water especially after seeing how its recycled again yuk!